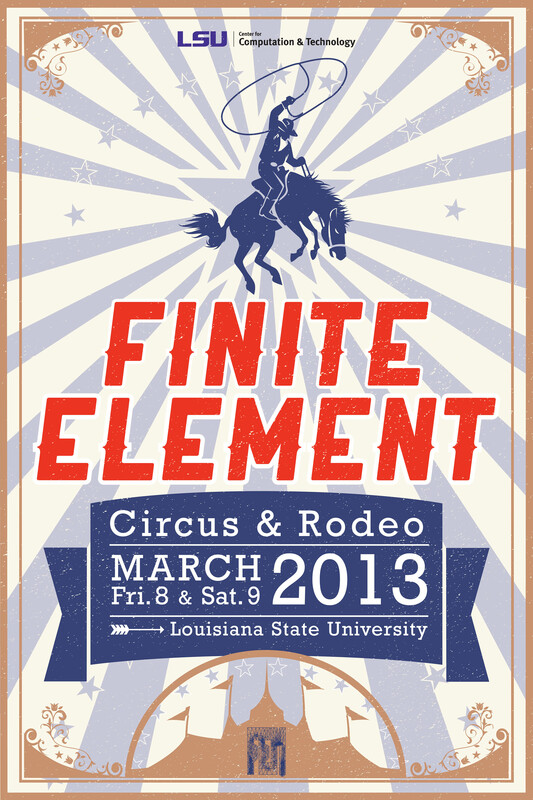 A joint meeting of the Finite Element Circus and Finite Element Rodeo will be held at Louisiana State University on March 8-9, 2013, hosted by the LSU Center for Computation & Technology. The Friday session will take place from 1:30 PM to 6:00 PM and the Saturday session will start at 8:30 AM. All talks will be held in the Energy, Coast & Environment Building, Dalton J. Woods Auditorium, Rotunda. Click here for directions and a campus map. The Finite Element Circus is a conference series with a rich history since the 1970's, focusing on new developments in the finite element method (FEM) and applications. Likewise, the Finite Element Rodeo is an important, more regional, annual conference that brings together researchers and students interested in the implementation and theory of the general class of finite element methods for various applications. Like regular Circus & Rodeo meetings, the program will consist of randomly ordered talks volunteered by conference participants. We invite faculty, staff and students to sign up to give a short talk, or to just attend. The closest airport is the Baton Rouge Metropolitan Airport (BTR). American, Delta, United and US Airways operate frequent jet flights to and from BTR to hubs in Atlanta, Charlotte, Dallas-Ft. Worth, Houston, and Memphis. Another option for flights is the Louis Armstrong New Orleans International Airport (MSY), which is approximately 75 miles from the LSU campus. Parking is available adjacent to and across the street from the Energy, Coast & Environment Building located on Nicholson Drive Extension (marked as a "commuter" lot). A parking permit is required to park in these lots. Please check the box on the registration form to request a free parking permit. (You can pick up the permit from the registration desk which will be located in the Energy, Coast & Environment Building Rotunda). Note: The inner part of campus has restricted access on weekdays. Please allow time for navigating around campus and parking. If you plan to attend the Finite Element Circus and Rodeo, please register here. A list of attendees can be found here. A local map with other hotels can be found here. A group dinner will be held on Friday evening, March 8th, at the LSU Faculty Club located on campus (Raphael Semmes Road at Highland Road). Cost = $25 per person (adult beverages: at additional cost). Click here for a google map to the Faculty Club. Lunch on Saturday, as well as snacks will be provided free-of-charge to registered participants. For a list of restaurants near the Staybridge Suites, click here. For eateries located on the LSU campus, click here. For a list of restaurants in the LSU area, click here.